The Set Preferences Window allows you to set a large range of settings. 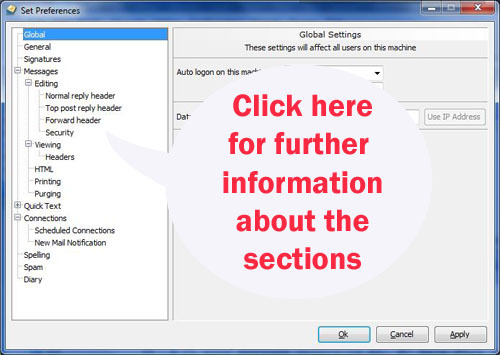 All preferences (except for those on the global tab) apply only to the currently logged in MailCOPA user, irrespective of which Windows user is logged in, or, which machine they are connected from (in a multi-machine installation). There are a few exceptions to this, eg fonts which depend on their being installed on the local (client) machine - these are stored in the registry. The preferences on the global tab apply to all MailCOPA users on this machine, however, since those preferences are stored in the Windows Registry, different global preferences can be set up for different Windows users. This would for example, allow a different MailCOPA user to be automatically logged in for each Windows user.